Jesus came to John the Baptist. When we are baptized our sins are washed away and we are forgiven. 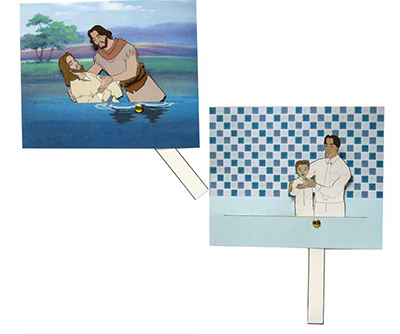 Jesus was without sin, but he still came to John the Baptist to be baptized. Following in Christ’s footsteps will lead us to exaltation. Our baptism day is a special day. It is the day that we receive the first ordinance of the gospel that leads us back to our Father in Heaven. It is a happy day that should always be remembered. Mary sat on the floor, coloring in her John the Baptist activity book, while Mother’s sewing machine quietly hummed along. “I’m almost ready to have you try on your dress.” Mother announced as the sewing machine came to a stop. Anxiously Mary put down her crayon and jumped up. Hurrying to Mother’s side, she watched her remove the row of straight pins, before pulling the dress over Mary’s head. Mary was helping set the table when she heard the back door open. She quickly folded the last napkin and ran to meet her great-grandmother with a big hug. “Hurry quick, Grandma-great. Lunch’s ready and I want you to sit by me!” Mary said as she tugged on her great-grandmother’s hand. “Slow down just a minute and let me look at you,” Grandma-great said. “Oh my you can’t be my little Mary, you’re way too big,” she continued. Nettie laughed with amusement at her grown-up great-granddaughter. Just then Cory and Logan dashed into the room. “Woo hoo! Grandma-great’s here,” they shouted before fighting for a hugging position and nearly knocking Great-grandmother off her feet. “You boys be careful!” Father reprimanded his rambunctious sons. “Go get washed up for lunch now. And make it fast. I’m starving!” He said before greeting Mother with a kiss on the cheek. After lunch father shooed the “girls” out of the kitchen. Insisting that he and the boys would clean up. “Were you baptized in a river? Just like Jesus?” Mary asked. Mary sat wide-eyed as her great-grandmother recalled the memories of her special day. Mary looked in awe at her great-grandmother, who seemed to be glowing. “Did you catch a cold?” Mary asked curiously. During this fun baptism activity your family will learn by discussion and demonstration how we are baptized by immersion like Jesus! Immersion is the dipping of something in liquid so that it is completely covered. When we are baptized by immersion we are completely covered with water. 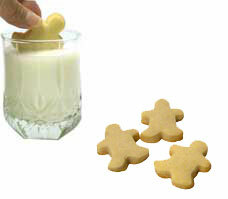 When eating “Immersion Cookies” completely immerse (dunk) cookies into a cold glass of milk. YUM!